The latest Nielsen survey to gauge New Zealanders’ attitudes towards science and technology is the largest and most thorough one yet and reveals much to be positive about but also several areas of concern. Nielsen surveyed a representative sample of 3,004 New Zealanders over the age of 15, (2,504 online and 500 by phone), asking them a series of questions about their views on science and technology. Similar surveys were done in 2002, 2005 and 2010 and the bulk of the 2010 questions have been retained for continuity. However, this survey has a couple of significant differences – it focusses on how Kiwis engage with science, so as to give us insights into the best ways to reach different audiences, and it lines up with Eurobarometer survey questions and 2014 the ANU University study into Australian attitudes towards science, to allow us to more easily compare our attitudes towards science and technology to other countries. So what did the latest Nielsen research find? – Broadly speaking, Kiwis are interested in science and technology and think it is important not just for them personally, but for society, the environment and the economy. – 90% of those surveyed agreed that science is an important subject for people to study at school and 83% agreed that it was a worthwhile career to pursue. – Kiwis are more engaged with science and technology than they were in 2010. Compared with 2010 the “science follower” group survey participants identified with has increased, while the “mainstream” and “disengaged” segments have decreased. That means more people identify themselves as enjoying following science and less people have a lack of trust and interest in it. That’s a very positive trend. 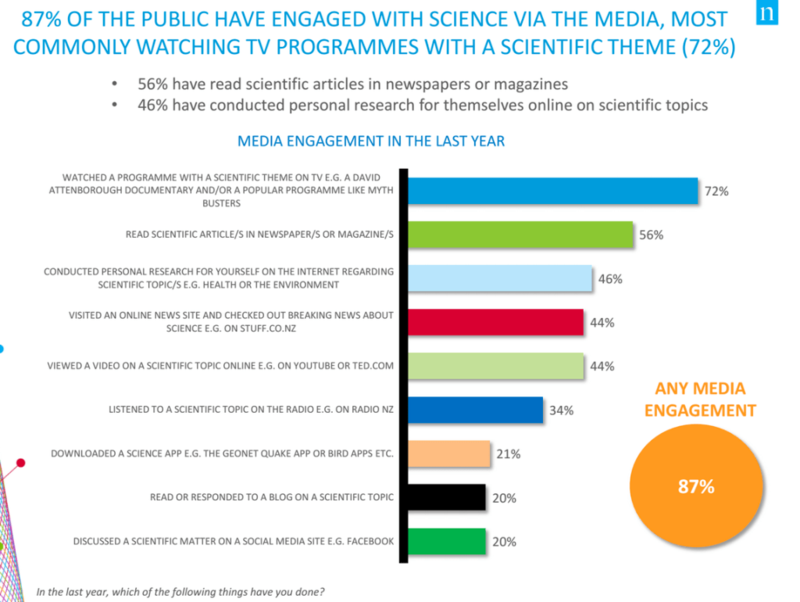 – Engagement with science and technology via the media is very high (87%) which shows that despite the proliferation of social media and fragmentation of media channels, the population in general still has high exposure to science and technology via TV, online news reports, newspapers and magazines. – 44% of those surveyed said they had donated money to support scientific research, showing healthy support in the community for such causes. – Kiwis feel much better informed about science than people in European countries do (we rank second 62% behind Denmark 65% in this measure). So all of that is very positive. We are more engaged with science and technology than we were five years ago, we compare really well internationally and overall, Kiwis value science and consider it important to study at school and pursue as a career. – Only 59% consider science important to their daily lives. – 42% of people say they get too little information about science, a fair chunk of the population, suggesting there is still a significant deficit in knowledge based on lack of access to information about science and technology in a suitable format. – A reasonable proportion (35%) agreed that science and technology are too specialised to understand and 51% agreed that there is too much conflicting information about science and technology “making it hard to know what to believe”. – Young females are less into technology as an important topic to study at school. – 62% agreed that scientists need to listen more to what ordinary people think, suggesting a bit of a disconnect between the work scientists are doing and the priorities of average New Zealanders. – Only 39% agreed that Mātauranga Māori (traditional Māori knowledge) has a role in science. This is an area that has been targeted for promotion by the Government and increasingly by iwis, so that’s not an encouraging result. – Males feel significantly better informed about science than females. – There is low engagement with science-based products or practices at work. Only 15% had undertaken additional scientific training for work. – In some cases Māori and Pacific Island people are less likely to agree that science is really important. So there’s plenty of room for improvement. The survey gives us a good base to work from in terms of figuring out ways to more effectively engage New Zealanders with science and technology. What is really useful, is that the survey gives us a decent baseline for the formats via which we engage with science and shows how different demographic groups access science and technology information in different ways. You can download the Nielsen survey here.